A short demonstration of how to enter a search strategy, apply limits and view results. In two short minutes, learn how to go from a broad topic to specific search results- by changing search keywords. 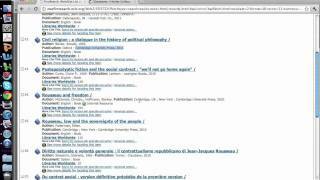 This video demonstrates how to locate the abstract of an article in the research databases. Learn techniques for conducting more precise searches. Includes use of subject indexes, Boolean searching, and citation tools. Learn how to use Thoreau to search multiple databases on a topic. I show you how to create a youtube account. See the results page from a Google Scholar search. Learn how to identify links to full text, publication information, and more. Steps for performing a search for tests and measures in the CINAHL database using the limit for publication types. Watch a search in an Education database. See how to choose keywords, enter them into the search boxes, and find full text results. 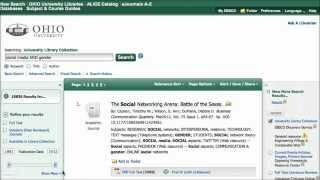 Week 1 discussion post search example using ProQuest Central. 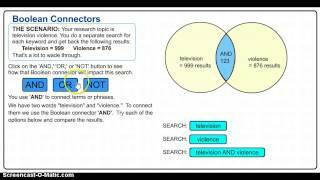 Demonstration of a search in ProQuest Central to support the Week 6 discussion assignment for the COMM-1001 course. Begins at the COMM-1001 course page.